My family lived in Belchamp Walter for many years and I am interested in finding out about the development of Belchamp Walter; when properties were built, what they were called and matching them to the censuses from 1841 to 1911. I'm looking for maps of the village, especially from 1800 onwards, and wonder if anyone else has already done research in this area. I would like to get in touch with anyone who might be able to help. 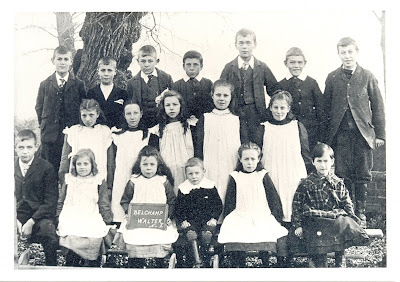 Here is a picture of BW school probably taken about 1905. (click on it to see it full-size). A few of the pupils have been identified but I wondered if you would like to add it to the website to see if anyone can add any more names. The boy in the back row on the far right is Harry Wright. In the middle row, 3rd from the left is possibly Clara Twitchett and on the far right is Nellie Pettit. In the front row, from left to right, Annie Wright is holding the slate, and next to her is William Wright and Elizabeth Wright.